Bio: Marleen Wallingford is a Sansei born in Portland, Oregon. She is the president of the Portland JACL and is an active volunteer in her community. Marleen retired from Portland Public Schools after nearly 30 years in education. Yoshinosuki, his wife Asano, and their four children (Lois, Marie, Shin and Roy) lived and worked on their Bethany-area farm. They also attended the nearby Bethany Presbyterian Church. It was their connection to the community that helped save their farm once their world was thrown into chaos after the Japanese attack on Pearl Harbor. Everyone of Japanese ancestry was forced to leave the West Coast. The Sato family was incarcerated at Minidoka in Idaho. The members of the church visited them at the Portland Assembly Center and then banded together to make sure the annual property taxes on the farm were paid so the family had a home to return to after the war. 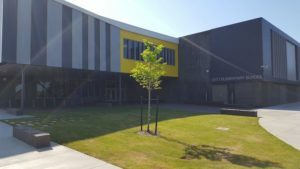 In 2017, Sato Elementary, one of Beaverton’s newest schools, was opened. Not everyone was aware that the school had been named after the Japanese American family who lived near the Bethany site in Beaverton, Oregon. This story would have been lost without the diligent efforts of Colonel Mike Howard who heard about the family from his friend, Gene Zurbrugg, who is a longtime resident of the Bethany area and was a boyhood playmate of the Sato boys. After he shared the story, Colonel Howard went to visit the school but there was no information about the family. He felt that the students and the Bethany community should be reminded of the sacrifices and hardships that the family had suffered. Both Shin and Roy joined the segregated Japanese American 442nd unit. Roy was wounded (twice) and his brother, Shin, was killed in France during the legendary battle to free the trapped Texas battalion where over 800 Nisei soldiers died while saving 211 men. Their sister, Marie, served as a volunteer military nurse for the duration of WWII. 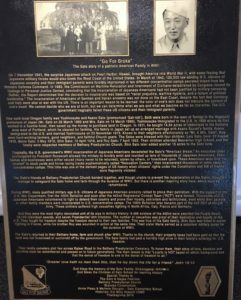 On November 15, 2018, a special ceremony was held at the school to dedicate a chestnut tree donated by the Sato Family and a soon-to-be-constructed historical plaque. The chestnut tree is significant to the Sato family. On their farm, there was a chestnut tree whose fruit was used as a special addition to meals. Chestnuts were very special to Mrs. Sato who used them in special treats. The tree and the farm are only a memory now but if you go to Sato Elementary, the plaque there will tell the Satos’ story. The Satos’ daughter, Lois, was the last to live on the family land. She sold part of the property to the Presbyterian Church that had treated her family so well. Years later, the church sold the plot to a developer and used the proceeds to establish the Lois Sato Memorial Mission Fund which is used for projects in Bethany and around the world. When school names were proposed, the Bethany community overwhelmingly supported naming the school, Sato. The beautiful school is close to the original farm and across the street from where family members are buried in the Presbyterian Cemetery on Kaiser Road.